This First Look guide helps you develop interfaces in Java that connect systems together with an InterSystems IRIS™ interoperability production. An interoperability production is an interoperability framework for rapid connectivity and the development of new connectable applications. The production provides built-in connections to a wide variety of message formats and communications protocols. You can easily add other formats and protocols and use a graphic interface to define business logic and message transformations. Productions provide persistent storage of messages, which allow you to audit whether a message is successfully delivered. A production consists of business services, processes, and operations. Business services connect with external systems and receive messages from them. Business processes allow you to define business logic including routing and message transformation. Business operations connect with external systems and send the messages to them. In this guide, you will learn how to connect two Java programs with a simple production. For demonstration purposes, this document uses very simple Java code. A Java program for the data collection system or the work order system would be more complex and require a DTD schema, but you would use the same procedure to connect them with InterSystems IRIS. A business service that provides the interface for a message coming from an external system. A business process that provides any needed business logic and message transformation. A business operation that provides the interface for a message going to an external system. There are some business services and operations provided with InterSystems IRIS. If it has one that supports the message format that a system uses, you can avoid custom coding. But in many cases you will have to develop a custom business service and operation. You can develop these using the InterSystems IRIS ObjectScript or using Java. There is an available Java library that parses the message format used by the system, and it is quicker to use the library rather than custom coding a parser for the message format. You prefer to develop custom code in Java rather than in InterSystems IRIS ObjectScript. To connect your Java code to the production, you have to implement the following classes and methods. OnInit  this method is called when the production starts or the business service is enabled. It typically starts a listener that will receive messages. The listener receives the messages from the external service and then sends them to the business service in the production by calling the method Production.SendRequest(). The production is passed in as an argument to OnInit. Your code should save it so that it can call SendRequest in the listener. OnTearDown  this method is called when the production is stopped or the business service is disabled. It typically stops the listener. OnInit  this method is called when the business operation starts. It typically initializes any structures needed by the OnMessage method. The production is passed in as an argument to OnInit. OnMessage  this method is called when the business operation receives a message. It is responsible for sending the message to the external service. OnTearDown  this method is called when the business operation ends. It typically releases any structures created by the OnInit method. SendRequest  Sends a request message to the target configuration item of the Business Service. This method is only available to the BusinessService. It is not available in the BusinessOperation. GetSetting  Gets the value for the specified Business Service or Business Operation setting. SetStatus  Sets the status of the Business Service or Business Operation configuration item and changes the color of the item on the Production Configuration page. LogMessage  Writes a message to the production log. You can use this to report errors or to help debug code. In this section, you will connect two Java hosts in a production. For demonstration purposes, these are very simple Java programs. Rather than getting messages from an external service, the business service just generates a random message. And the business operation writes the message to a log. Connecting to an external server requires more complex Java code, but you would follow the same process to connect the Java code to the production. You also need to clone or download the FirstLook-JavaHosts sample code from github: https://github.com/intersystems/FirstLook-JavaHosts, and build the JAR files from the included sources. These JAR files must be accessible to InterSystems IRIS. Go to https://github.com/intersystems/FirstLook-JavaHosts in a web browser. Follow the instructions in the README to build the JAR files. Finally, use the Management Portal to create an interoperability-enabled namespace, if your instance does not include one, and ensure that there is no running production in the namespace. Instructions for this step are provided in Creating an Interoperability Namespace in First Look: Connecting Systems Using Interoperability Productions. The URL to open the Management Portal in your browser depends on the type of instance you selected; for information about determining the correct URL, see InterSystems IRIS Connection Information in InterSystems IRIS Basics: Connecting an IDE. The Java code needs credentials to have access to the production. For this example, you can use the same InterSystems IRIS account that you use to develop a production. For a live system, you would create an account that has the privileges needed to run the production, but not any extra privileges. Select Interoperability > Configure > Credentials. Specify an ID, such as JavaHostsCredentials, and a user name and password for an account on the InterSystems IRIS system. Then select Save. Select Interoperability > Build > Java Business Hosts. Select Start New Production, give the production a name, such as JavaHostsProd, leave the other fields with the default values, and select OK twice. This creates a new production, adds the EnsLib.JavaGateway.Initiator component to it, and starts the production. If this step succeeds, the Java Business Hosts page will have a message indicating that the production is running and contains a Java Gateway Service. If you don’t get this message, you may have a problem with the environment variables or Java JDK installation. Java Home  Specifies the location of the JVM. Class Path  Specifies the JAR files imported in the Java code. This sample only imports the java.io.FileOutputStream, java.io.PrintWriter, and java.util.Random classes, which are included in the Java system JAR files. It also uses the intersystems-gateway-3.0.0.JAR file which is provided in the install-dir\dev\java\lib\JDK18 directory. JVM Args  Specifies any arguments you need to specify for your JVM. If you have specified values for any settings, select Apply. Select Browse and select the JAR file generated for the business service. Select the name of the Java class, such as JavaHosts.JavaHostsService, from the drop-down menu. Accept the default ObjectScript class name, such as JBH.JavaHosts.JavaHostsService. For this sample, accept the default Format of Incoming Data, Plain Text. Select the credentials that you created in the previous step from the drop-down menu. 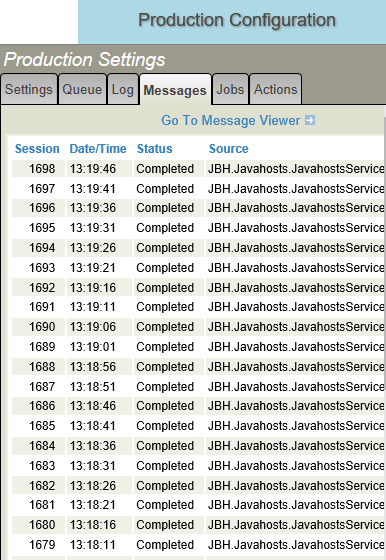 A form is displayed that informs you that you have Successfully generated class 'JBH.JavaHosts.JavaHostsService'. Select OK and it returns you to the generate business host form with the fields with their current values. Select Browse and select the JAR file generated for the business operation. Select the name of the Java class, such as JavaHosts.JavaHostsOperation, from the drop-down menu. Accept the default ObjectScript class name, such as JBH.JavaHosts.JavaHostsOperation. A form is displayed that informs you that you have Successfully generated class 'JBH.JavaHosts.JavaHostsOperation'. Select OK and it returns you to the generate business host form with the fields with their current values. You have completed creating the production and generating the business hosts. In the next section, you add the business hosts to the production and configure them. Select Interoperability > Configure > Production. Select the Operations plus sign to display the Business Operation Wizard. In the Operation Class drop-down menu, select the business operation, JBH.JavaHosts.JavaHostsOperation, that you generated using the Java Business Hosts page. Select the Enable Now check box. Select OK and then OK to the Production Updating message. In the Service Class drop-down menu, select the business service, JBH.JavaHosts.JavaHostsService, that you generated using the Java Business Hosts page. Leave the Enable Now check box clear. You will enable the service in the next step. In the Target Config Names drop-down menu, select the JBH.JavaHosts.JavaHostsOperation operation. Optionally, specify an integer value for the Min and Max settings. Select Apply and then OK to the Production Updating message. You’ve finished configuring the business hosts and the production. All the business hosts in the production diagram should be green and the production should be running. In the next section you will examine the messages. Once you enabled the business service, the production started sending messages. To see the messages, select the Messages tab on the Production Configuration page. The messages are displayed as shown by the following. If there are no messages displayed, select Go To Message Viewer. Select Stop on the Production Configuration page to stop the production. You can restart the production by selecting Start.